9mm carbon potentiometers with plastic housing and Ingress Protection rating type IP 54 (high level of protection against dust and also against water splashing), according to IEC 60529. Plastic materials can be self-extinguishable according to UL 94 V-0 under request. Through-hole and SMD configurations are available. Terminals and collector are normally manufactured in tinned brass, although versions with steel terminals are also available under request. Terminals for through-hole models can be provided straight or crimped, which helps hold the component to the PCB during soldering. Tapers can be linear, log and antilog; special tapers can also be studied. ACP’s potentiometers can be adjusted from either the front or the back, both in the horizontal and the vertical adjustment types. Thumbwheels and shafts can be ordered either separately or already inserted in the potentiometer. - Tapers / variation laws. - Positioning of the wiper (standard is at 50% rotation). - Click effect (up to 20 detents available). - Self-extinguishable plastic parts according to UL 94 V-0. - Industrial: Timers and relays, dimmers, adjustment of output. - Electronic appliances: volume regulation, temperature controls and function selection. - Automotive: Lighting regulation (position adjustment and sensing for headlights), dimmers, seat heating controls. 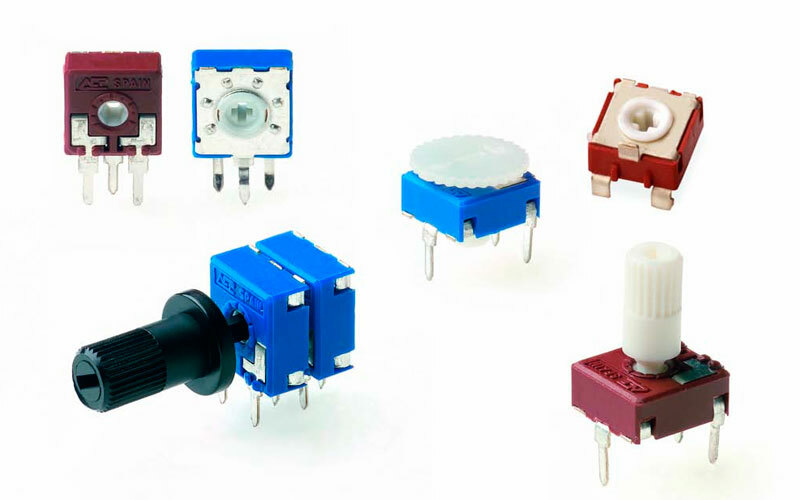 9mm cermet potentiometers with plastic housing and Ingress protection rating type IP 54 (high level of protection against dust and also against water splashing), according to IEC 60529. Plastic materials (housing and rotor) are self-extinguishable according to UL 94 V-0 for ACP’s cermet potentiometers. Cermet potentiometers have better thermal stability, allow for higher thermal dissipation and withstand higher temperatures than carbon potentiometers. Through-hole and SMD configurations are available. Terminals and collector are manufactured in tinned brass, although versions with steel terminals are also available under request. Terminals for through-hole models can be provided straight or crimped, which helps hold the component to the PCB during soldering. - Electronic appliances: temperature controls. - Automotive: climate controls, position sensors, seat heating controls. - Industrial electronics: multimeters, oscilloscopes, time relays, measurement and test equipment.